If you thought they were referring to me, I can understand how you’d be confused by those glowing testimonials. The comments though, were about Dean Martin who, much like myself, was able to beguile entire generations with his warm sensuality. Okay, you can stop laughing now, and let me tell you why I’m talking about the beloved crooner. Today’s featured property, a condominium high-rise, is located in Las Vegas on Dean Martin Drive and aptly called “The Martin.” See? I told you there was a connection. 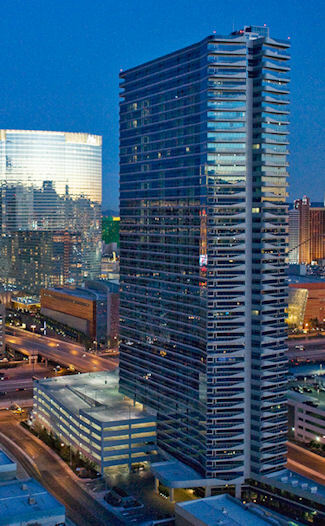 The Martin is a 45-story tower with 372 condos located just off The Strip in Las Vegas. A 45-story tower of sleek, flowing glass, The Martin offers incredible views of The Strip along with panoramic vistas of the surrounding mountains. 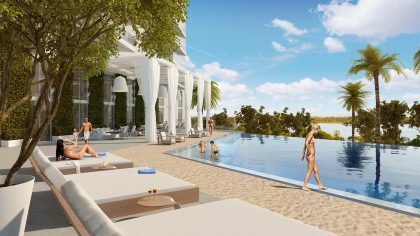 It has a total of 372 impeccably designed one- and two-bedroom residences as well as five lavish penthouses on the top three floors. Let me fill you in on the back story. 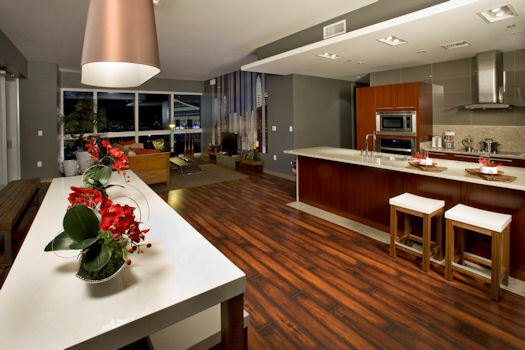 The condos offer dramatic floor-to-ceiling views of the city and mountains in the distance. Built in 2008, the property was designed by Klai Juba Architects of Mandalay Bay fame. Unfortunately, like so many high-rise condominiums in Las Vegas built that year, sales were slow. The drop in the real estate market and a lack of any financing for buyers caused the developer to run into financial difficulties and motivated him to sell. iStar Financial, a real estate investment trust, was originally a lender on this condominium tower. 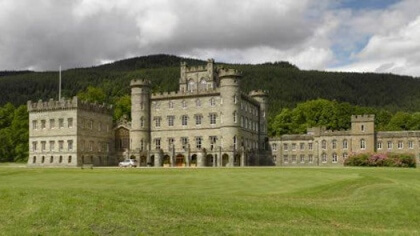 But the company thought so much of this property that, when the opportunity presented itself, they purchased it from the original developer. They then spent nearly $3 million in redesign and amenity upgrades and rebranded it as The Martin. Financially speaking, this is a healthy development. There are zero foreclosures and short sales in this building, and there are no HOA deficits. 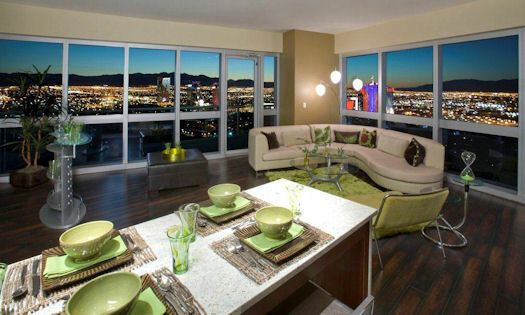 In fact, with over 100 condos recently sold, it is now one of the fastest selling properties in Las Vegas. iStar Financial has invested nearly $3 million in upgrading The Martin’s design and amenities. Residents of The Martin enjoy a dedicated ownership team available to facilitate reservations, special requests and unique experiences for all of their living needs when you’re in Las Vegas. Picture this. Upon touching down at McCarren Airport, have The Martin’s dedicated chauffer pick you up with The Martin’s Range Rover car service. Let the doorman greet you at The Martin while the bell service delivers your luggage to your door. Did you just come in off the red eye flight? Well, you are just in time for the complimentary breakfast served every morning in the library. Of course, after being away for a while, you may be thinking of all the things you need to get to, but getting groceries won’t be one of those things, since The Martin staff already took care of your pre-arrival shopping and home preparation. 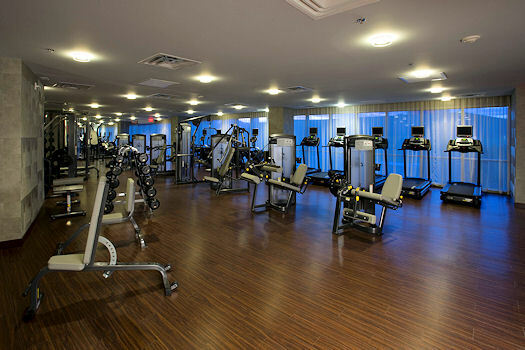 Among the amenities is a state-of-the-art fitness center and yoga studio. Kitchens come with Italian-built mahogany cabinetry and Kashmir white granite countertops. The residences at The Martin offer an impressive finish level. They have special touches like 8′ solid wood doors, 10′ to 12′ 6″ ceiling heights in living areas, foyers with Kashmir white granite floors, spacious decks and Juliet balconies in select residences. 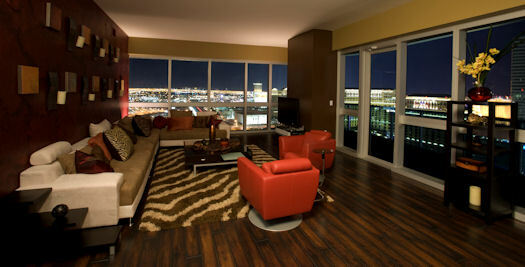 They offer dramatic floor-to-ceiling views of the city, mountains and horizons, making each home a Las Vegas showcase. 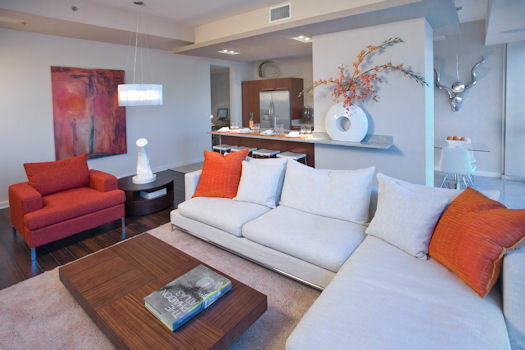 The living areas are spacious and have 10′ to 12′ 6″ ceiling heights. The Martin arguably boasts the best location of any Vegas high rise; no hassles of being on the Strip, yet right in the middle of the action. 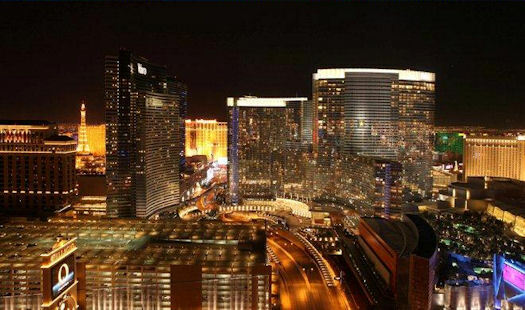 It is just west of the Cosmopolitan, Bellagio, Monte Carlo and New York New York Hotel and Casinos. The Martin is also a mere few hundred steps to the front door of CityCenter. Having CityCenter so close is like having a best friend next door with a home movie theater, a fully-stocked bar and an open invite. CityCenter is the largest privately developed property to be built in the United States. At a cost of over $9 billion, (yes, that’s billion with a b!). CityCenter is literally a city within a city. 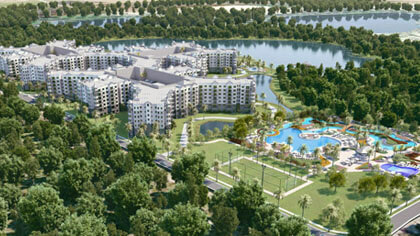 It is a mixed-use resort with 1/4 mile of frontage on the Las Vegas Strip. The Martin offers breathtaking views of nearby CityCenter, the $9 billion development on The Strip featuring restaurants, bars & nightlife destinations. It features over 20 new dining concepts, the Aria casino, marquee shows like Cirque du Soleil®, the chic nightlife of HAZE, and numerous trendy bars in the Mandarin Oriental. For shoppers, there’s Crystals at CityCenter with its unprecedented collection of the world’s luxury brands from the Louis Vuitton flagship store to Bulgari, Prada, Mui Mui and more. Residents of The Martin can revel in the excitement of nightlife, fine dining and entertainment that makes Las Vegas great and then retreat quietly to the comfort of home. 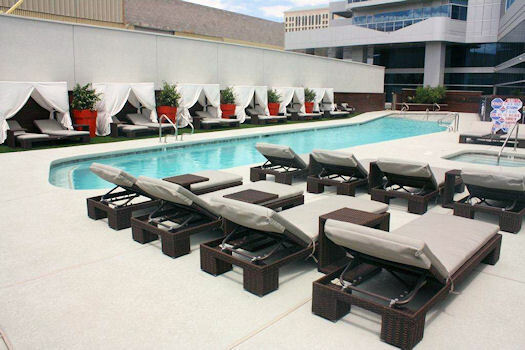 The Martin is a relaxing oasis but close to the fun and excitement of The Strip. One of the world’s biggest casino operators, Caesars Entertainment, has hired Los Angeles shopping center magnate Rick Caruso to develop a $550-million retail and entertainment district in the middle of the Las Vegas Strip crowned by an enormous Ferris wheel. The Linq, a new open-air attraction across Las Vegas Boulevard from Caesars Palace will be an outdoor venue with more than 200,000 square feet of shops, eateries and bars. Whereas the hotels and casinos invite you in, the Linq will be the new alternative for the millions of people walking around the sidewalks in Vegas. 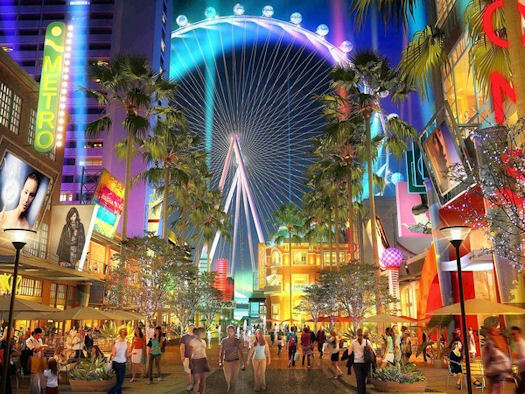 Construction on the Linq is set to begin late this year and to be completed by 2013. Now that you know all the great reasons to want a home in Las Vegas, let me tell you what’s available. The Martin has eight different one- and two-bedroom models from 1,035 to 1,962 sq. ft. Prices range from $259,000-$405,000 for the ones and from $222,200 to $1,088,000 for the twos. But, there’s a special buying program that makes these prices even more attractive. The developer has graciously agreed to extend this offer for Condo Hotel Center customers going into September for a limited time. Closings can take place quickly. Competitive, in-house financing is available. The Martin residences are move-in ready. Financing is available. Want to know more? I’ve put together a comprehensive data sheet on The Martin that has all the details. Just reply to this email with 1) your first and last name, 2) mailing address and 3) phone number, as required by the developer, and I’ll send it right out to you. Request The Martin data sheet here. As always, a big thank-you for your interest in the properties we showcase at Condo Hotel Center. Please feel free to share this Property Alert with any friends who might be interested in a Las Vegas home or in any of our other featured properties.